For lovers of apple, cash crop farmers and others in the areas of processing and export of apples, an amazing wealth creation opportunity is beckoning with the introduction of Malay apple, a new variety being developed in Nigeria. This specie, invented in Malaysia, Southern Asia, and commonly cultivated from Java to the Philippines and Vietnam, is currently being cultivated in other parts of Central America, including Belize, El Salvador and Costa Rica, and much more frequently in parks and gardens in Venezuela. This new variety is a unique tropical apple variety that has now finds its way into Nigeria. It is yet to be widely cultivated, and is still relatively new to the market. Though it comes in three colours-red, green and cream, the common type in Nigeria is the red colour; the green is scanty, while the cream colour may not be readily available now. It has a sweet sour taste. It also comes in three different shapes-oblong, obovoid and bell, with the shelf life of three to four days. When mature, it stays between 17-19 days on the trees before harvest. 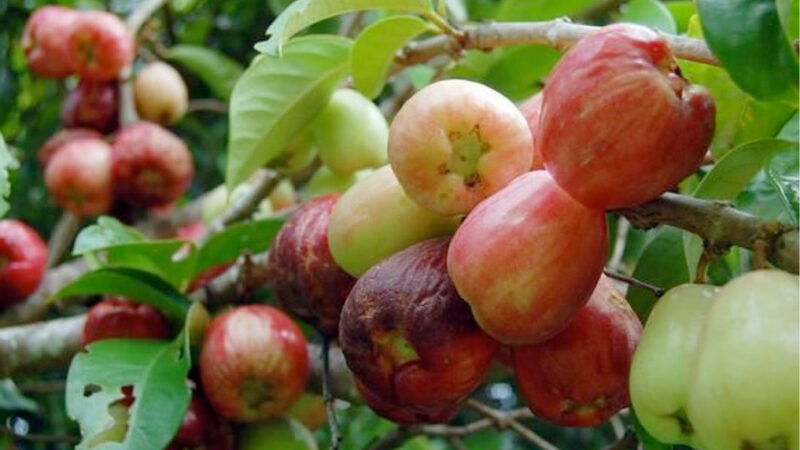 According to Mr. Akinyemi Oluwagbenga, an agronomist and pioneer Malay apple farmer in the country, as a tropical apple tree, it requires ample humidity, high rainfall, and no frost (cold condition). “It grows quite well in many parts of Nigeria. Once these basic conditions have been met, the Malay apple trees need little else to thrive. It can be planted in homes, parks, gardens and established as apple plantation for commercial purposes. “The tree starts producing apples three years after planting, while the temperate apple tree produces apples from the sixth year after planting. It produces apples two or three times per year. It is a prolific variety, producing about 1,000 apples per tree per harvest, as it grows older, that is about 2,000 apples per tree per year. One advantage of this apple according to the agronomist is its highly medicinal and nutritious content, as testified in the scientific world Journal, health sciences and Food chemistry. Reports have it that the powder of the dried leaves can be applied on a cracked tongue, just as a preparation of its root is a remedy for itching. The root bark is useful against dysentery and the juice of crushed leaves is applied as a skin lotion and added to bath. In Brazil, various parts of the plants are used as remedies for constipation, cough, diabetes, headache and other ailments. In the area of storage, Akinyemi said the Malay apple does not store well in refrigerator, as it is susceptible to cold. “Keep the apples on the counter for three to four days. He explained that cultivating the apple will boost local fruit production; make available fresh apples for healthy living without use of chemical preservatives; for adoption as remedies for overcoming different health challenges; to reduce Nigeria’s import bill on apples from South Africa, Europe and Asia; as amazing wealth creation opportunities for people in areas of production, processing into valuable products for local consumption and export, information and internet marketing; and to create job opportunities for graduates of agriculture and other relevant disciples. “On farm plantation, the recommended spacing is 5m by 5m.